This year, Brandeis celebrates the centennial birthday of acclaimed American composer and conductor Leonard Bernstein, a Brandeis faculty member and a supporter of the University from its earliest days. 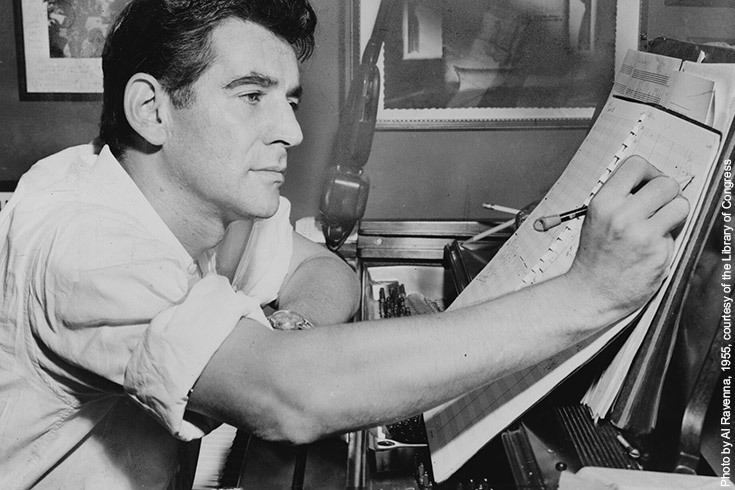 From 1951-56, Bernstein taught courses at Brandeis on modern music, opera and composition. He founded the university’s Festival of the Creative Arts, which today honors his legacy as an artist, an educator, an activist and a humanitarian. Centennial events included special concerts, classes and other campuswide activities during the Leonard Bernstein Festival of the Creative Arts, April 15-22, 2018. Featured events included selections from Bernstein’s opera "Trouble in Tahiti" performed by the Boston Lyric Opera; "Late Night with Leonard Bernstein," a cabaret-style concert narrated by his daughter, Nina Bernstein; and a concert version of Bernstein's “Mass,” performed by the Brandeis University Chorus and guest artists. Leonard Bernstein at 100 is the worldwide celebration of the 100th birthday of Leonard Bernstein. Visit the official website to learn more about Bernstein’s life and works, share your memories of Leonard Bernstein, and to follow news of centennial events around the world. Leonard Bernstein’s childhood piano, given to Brandeis in 2002, usually sits sedately in the Slosberg Music Center lobby. The piano is on loan to “Leonard Bernstein at 100,” organized by the Grammy Museum in Los Angeles to celebrate the centenary of the birth of the renowned composer, conductor and one-time member of the Brandeis music faculty.